Locally owned for three generations, Mattix Cabinet Works started 70 years ago building cypress shutters for French Quarter homes. Now it offers in-house design, including a wide selection of cabinets, countertops and appliances (and installation). In addition, they use 20/20 kitchen designing software, which allows customers to see their new rooms prior to making any purchases. Manson and Paul Mattix, their families and staff know and appreciate the importance of their deep local roots. “Because of the eclectic tastes of the customers in and around New Orleans most of our jobs are ordered custom, “ says Paul Mattix. “We offer a vast variety of door styles, wood species, paint, stains and other finish techniques so we can satisfy our customers’ specific tastes and styles. 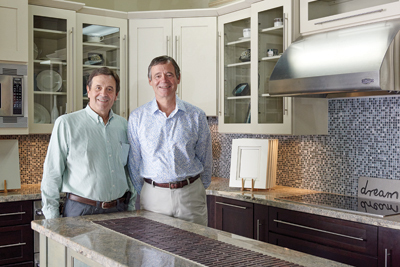 Our customers are wanting creative design, unique storage solutions and quality American-made products,” the Mattixes say. The company is excited to be a dealer for Wellborn Cabinets, a well-respected national manufacturer that produces a wide range of product in every quality and price category. They also take pride in their offerings of Shiloh All-Wood Cabinetry with inset doors in almost any wood or finish you could imagine. These experts say that custom cabinets make absolute sense when the “design desires, color schemes,and unique features required cannot be obtained from a stock product or semi-custom product. If you can draw it, we can likely get it manufactured.